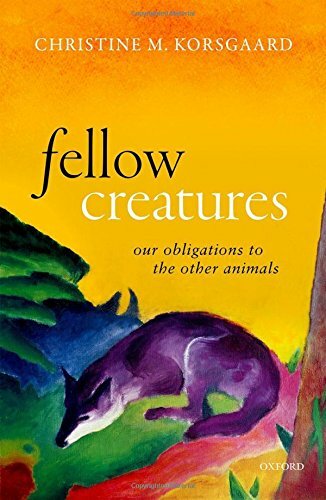 Christine M. Korsgaard presents a compelling new view of humans' moral relationships to the other animals. She defends the claim that we are obligated to treat all sentient beings as what Kant called "ends-in-themselves". Drawing on a theory of the good derived from Aristotle, she offers an explanation of why animals are the sorts of beings for whom things can be good or bad. She then turns to Kant's argument for the value of humanity to show that rationality commits us to claiming the standing of ends-in-ourselves, in two senses. Kant argued that as autonomous beings, we claim to be ends-in-ourselves when we claim the standing to make laws for ourselves and each other. Korsgaard argues that as beings who have a good, we also claim to be ends-in-ourselves when we take the things that are good for us to be good absolutely and so worthy of pursuit. The first claim commits us to joining with other autonomous beings in relations of moral reciprocity. The second claim commits us to treating the good of every sentient creature as something of absolute importance. Korsgaard argues that human beings are not more important than the other animals, that our moral nature does not make us superior to the other animals, and that our unique capacities do not make us better off than the other animals. She criticizes the "marginal cases" argument and advances a new view of moral standing as attaching to the atemporal subjects of lives. She criticizes Kant's own view that our duties to animals are indirect, and offers a non-utilitarian account of the relation between pleasure and the good. She also addresses a number of directly practical questions: whether we have the right to eat animals, experiment on them, make them work for us and fight in our wars, and keep them as pets; and how to understand the wrong that we do when we cause a species to go extinct.